Joint pains become a much dreaded reality as we age, which is why taking supplements that are made with reliable ingredients for pain relief can be an option for many. Restiflex Joint Pain Relief is one such supplement, based on a natural extract from the membrane of eggshells that contains all the major compounds contributing to joint health. Clinical trial showed on the manufacturer’s website attest for the product’s potency, so it looks like Restiflex Joint Pain Relief is a good choice when you are looking for a joint health supplement. What Does Restiflex Joint Pain Relief Contain? NEM® (Natural Egg Shell Membrane) – this contains several key compounds for joint health: Glucosamine, Chondroitin, Hyaluronic acid and Collagen. Methylsulfonylmethane (or MSM) – great for reducing pains and inflammation. White Willow Bark – also great for reducing inflammation. Ginger Root – traditionally used for relieving pain. Boswella Serrata – helps increase joint mobility. Turmeric – used commonly for treating joint problems. The list of ingredients looks very promising. The presence of glucosamine and chondroitin is commendable, since they are some of the most powerful ingredients for reducing joint pains. In order to get the best from this formula, you will need to take two capsules daily. One bottle contains 60 capsules, so you must purchase one for one month supply. The price tag for Restiflex Joint Pain Relief is 69.95USD, which is more expensive than other great, reliable products on the market. 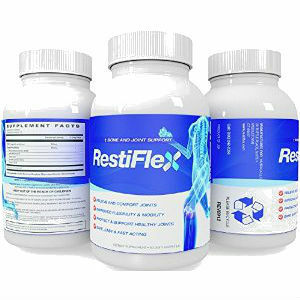 The company making Restiflex Joint Pain Relief offers 30 day money back guarantee policy, so you can return the product in case you do not see an improvement in your joint condition. Restiflex Joint Pain Relief looks like a reliable product for reducing pains and discomfort in your joints. Using some of the best ingredients for promoting joint health, it is based on traditional treatments, as well as recent clinical studies that show the potency of certain compounds like glucosamine and hyaluronic acid. Mark Stevens	reviewed Restiflex	on July 22nd	 and gave it a rating of 2.5.